"That in all things God may be glorified." Holy Rule of St. Benedict. As Mother of God, Mary was exalted to an incomparable height of holiness. Who can comprehend the lofty height of her greatness or fathom the abyss of her sanctity? St. Thomas attempted, and concluded that omnipotence itself could not invent a "greater greatness." It was necessary that her sorrows should correspond to her holiness, for the sufferings and tribulations of the Saints always keep apace with their sanctity. What then must Mary's sufferings have been in order to be proportionate to her greatness ---- the greatness of the Mother of God! Who can comprehend the immensity of her graces and merits, and consequently the enormous weight of sufferings required by such holiness, to complete her perfection, to crown her most condignly? 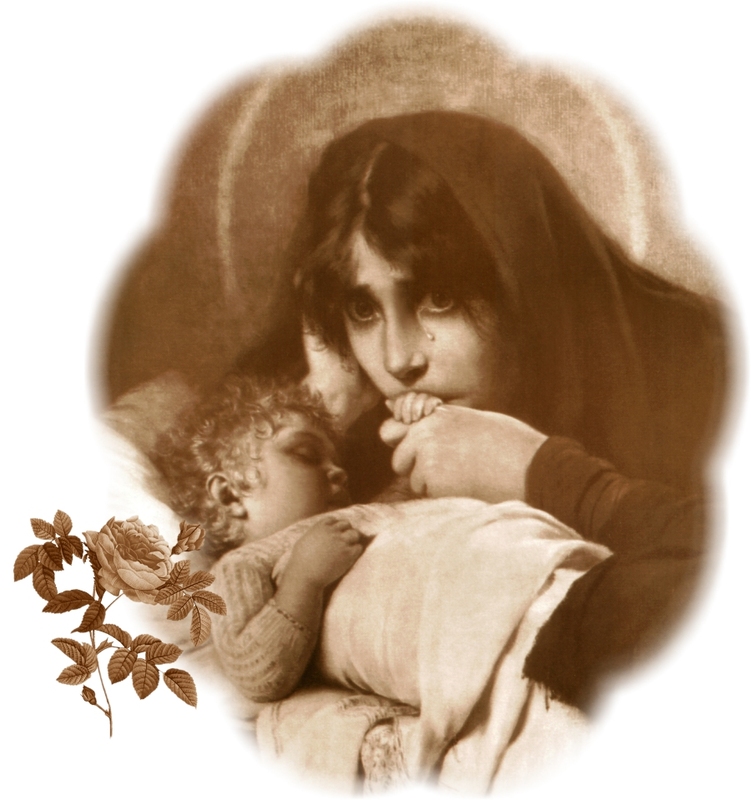 The sorrows of the Mother of God surpassed the power of human endurance. It is the unanimous opinion of spiritual writers that beneath the pressure of her inconceivable sufferings, the Blessed Virgin's life was miraculously preserved. From the moment of Simeon's prophecy she foresaw her sorrows in vivid reality. Without the special aid of God's omnipotence, her soul would have been separated from her body. True, Mary was marvelously tranquil, because she was wholly submissive to the will of God; but this did not lessen her sorrows. Her nature, never disturbed by sin, possessed an extraordinary tenderness and was susceptible to suffering in an inexpressibly high degree. "Men will never comprehend the anguish of my sorrows!" she revealed to St. Bridget. The picture of Mary bowed down with sorrow on Calvary teaches us that pain is the twin sister of love on earth. We can gain some idea of the immensity of the dolors of our Blessed Mother by considering the conditions that imparted special bitterness to her sufferings. Placed in similar circumstances with the Blessed Virgin Mary, what mother would not have longed to die with her son? But Mary could not die with Jesus, although union with Him had become so much a part of her nature that it actually constituted her life. Jesus, her Son, was the bliss of her heart, the sun of her existence. How could Mary live without Jesus! Still, she must see Him die, without being able to die with Him! What inexpressible grief! Another circumstance that in- creased the anguish of the Mother of God was the realization that her sufferings increased those of her Divine Son; that these were, in fact, some of the bitterest pangs He had to endure. It was His will that His Blessed Mother should form. a part of His sufferings. When we consider the boundless love with which He loved His Mother, we will understand that to meet her on His way to Calvary, to behold her beneath the Cross, was truly one of His most acute tortures. Mary knew this. What pain for her maternal heart to know that she must be one of the causes of His sufferings! Again, Mary was an eye-witness of the sufferings of her Divine Son. She saw Him bound to the pillar; she heard the lashing of the scourges, she saw His delicate virginal flesh writhe and quiver under the lacerating blows. She was present at the Ecce Homo scene, on the way to Calvary, and at the Crucifixion. And her anguish was further increased by the fact that she could offer no relief to her dear Son in His excruciating pains. As she stood beneath the Cross, she saw the Blood trickling from His thorn-crowned Head into His eyes, but could not reach His sacred Face to wipe the drops away! She saw His lips parched with thirst, pale and bloodless, but was unable to give Him a refreshing drink! His head had no pillow to rest upon, yet she was prevented from supporting it or letting it repose upon her bosom. Who can comprehend the anguish endured by her Mother-heart during those three endless hours of dreadful helplessness! As the Blessed Virgin stood beneath the Cross, there was still another source of most bitter sorrow for her, namely, her clear conception of the nature of sin. We may not doubt that Our Lord imparted to His Mother a supernatural knowledge of sin, its wickedness, its hideousness, and the borrow and hatred that God entertains for it. The hideousness of sin she beheld written on the Cross in the Precious Blood of Jesus. She saw the sins of the whole world, like a mountain, pressing upon the bowed shoulders of her bleeding, dying Son. She saw that He was truly God, thus crushed by the numberless sins of man, covered with their guilt, crucified by their malice! What unspeakable suffering for the sinless, guiltless, Immaculate Heart of our sweet Mother! Another source of Mary's unutterable grief was man's ingratitude for Our Lord's Passion, and the eternal perdition of so many souls for whom her Son's Precious Blood would be shed in vain. She, the Queen of the Apostles, the Mother of the Church, saw passing before her eyes a vision of the heedlessness of mankind for sins forgiven, the relapses into mortal sin, the amazing, frightful multitude of venial sins, the cold indifference, the disgust for Divine things, the desecration of the holy sacraments, the rejection and abuse of grace on the part of so many souls ---- all, consequences of the basest ingratitude. Now with the eyes of her soul she saw the multitude of the damned, for whom all the sufferings of her Son would be lost. At this sight, what indescribable pain must have pierced to its very depths the most loving heart of our dearest Mother! The sufferings of Mary at the death of her Divine Son rent her heart. Our Lord therefore said to St. Mechtilde: "Greet the heart of My Mother as the most patient of hearts; for it was pierced by thousands of swords, both during My Passion and Death, and afterwards when she remembered these dreadful torments." For fifteen years after the death of her beloved Son, until her own happy departure, the Passion of Our Lord was renewed over and over again in the heart of the Blessed Virgin. It was revealed to Mary of Agreda that after the ascension of her Son, Mary suffered inexpressibly every Friday, as do certain privileged souls who are favored with the stigmata. All these sufferings Mary endured for love of us. Many Saints have cherished a special love for Mary as the Mother of Sorrows. Saint Ignatius Loyola constantly wore an image of the Sorrowful Mother on his bosom, and venerated her with tender devotion. Blessed Henry Susso, who cherished a most tender compassion for the Dolorous Mother and meditated often on her sorrows, received wonderful revelations from her own lips. Mary said, among other things: "Consider that all the grief ever endured by a human heart would be as a drop of water to the vast ocean compared to the fathomless grief and anguish that my maternal heart endured at the foot of the Cross!" Saint Alphonsus Liguori made the sorrows of Mary the subject of his daily meditations and his deepest compassion. When he conducted a mission he usually placed a picture of the Sorrowful Mother beside the pulpit, so that the faithful, by gazing upon it, might devoutly reflect on Mary's sufferings and be encouraged to confide in her merciful intercession. During his sermons he often invoked the Mother of Sorrows and exhorted sinners to turn to her to obtain the grace of sincere conversion. Among his writings are several treatises on the sorrows of Mary. "Hail Mary, full of sorrows, the Crucified is with thee; thou art pitiable amongst women, and pitiable is the Fruit of thy womb, Jesus! Hail Mary, Mother of the Crucified, implore for us, the crucifiers of thy Son, tears of contrition, now and at the hour of our death. Amen." From the fact that Mary wished to have a religious Order in the Church which would have the veneration of her sorrows as its special object, we may infer how much Mary herself desires us to venerate her dolors. Devotion to the sorrows of Mary has been practiced in the Church at all times. This is proved by numerous passages from the writings of the holy fathers, by prayers, pictorial representations and touching hymns. But God desired that devotion to the sorrows of the Mother of His Son should remain an abiding practice among all the faithful. To accomplish His design, He called into existence an Order whose special object should be to practice and foster devotion to the sorrows of Mary. His Blessed Mother, Mary appeared to them in .heavenly beauty, accompanied by hosts of Angels. Some of the Angels carried the instruments of Our Lord's Passion; others carried black garments in their hands. One of the Angels held a book, the rule of St. Augustine; another held in his right hand a scroll bearing the title of the new Order, "Servants of Mary," in letters of gold, and in his left hand, a palm. The Blessed Virgin invested her servants with the black garment ---- it was the black scapular. While these Saintly men were enraptured at what they beheld, they heard these words from the lips of the Blessed Virgin: "I have come, my elect servants, to comfort you in reply to your earnest petitions. Behold this garment; wear it in future. The black color should continually remind you of the sorrows which I experienced on this day at the death of my Son. The palm which you behold announces to you the glory that awaits you in Heaven if you serve me faithfully on earth." The holy founders did as Mary bade them. Their spiritual sons have likewise propagated the devotion to the sorrows of Mary with great zeal. Even persons who are not members of the Order may participate in the merits and good works of its members by being invested with the black scapular of the Order. This scapular is usually included in the so-called fivefold scapular. Many graces and benefits may be gained by devoutly wearing this scapular, but those who wear it must also venerate the sorrows of Mary. Eternal Father, we offer Thee the Blood, the Passion, and the Death of Jesus Christ, the sorrows of Mary most holy, and of St. Joseph, in satisfaction for our sins, in aid of the Holy Souls in Purgatory, for the needs of holy Mother Church, and for the conversion of sinners. Virgin most sorrowful, pray for us!